How Are You Helping Mothers This Mother's Day and Beyond? Given that Mother's Day is this Sunday, it's time to take stock of just how important moms are to child well-being. For organizations that serve families, Mother's Day is a great reminder of how important it is to provide moms with help in being the best mom possible. While National Fatherhood Initiative® (NFI) focuses on how important dads are to child well-being, the importance of moms is not lost on us or the thousands of organizations we partner with across the country to create more involved, responsible, committed dads. That's because research shows children benefit from the unique parenting styles of moms and dads. A mom and dad are like pieces of a puzzle that fit perfectly together to form a whole that is indeed greater than the sum of its two parts. Organizations can purchase these resources separately. 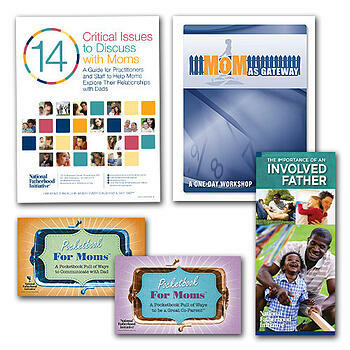 We've also bundled many of them together in the Moms Involving Dads Bundle to help take the guess work out of which NFI resources are ideal for working with moms. I encourage you to partner with NFI (or to keep partnering with us) to improve the relationship between the moms and dads you serve for the benefit of their children. Happy Mothers' Day from all of us at NFI to all the moms in our partner organizations that do such vital work day in and day out to create healthy families!